Members of Samford University’s Greek organization community gathered recently to celebrate accomplishments during the 2014-15 academic year and to honor the top chapters and members at the annual Greek Awards Ceremony. Jessica M. Smith Service Award: David Osula (Pi Kappa Phi), senior biochemistry major from Jasper, Ala. Outstanding Involvement: Julianna Hallman (Zeta Tau Alpha), Madison Miles (Phi Mu) and Margie Terp (Alpha Delta Pi). Hallman is a senior journalism and mass communication major from Jasper, Ala. Miles is a senior journalism and mass communication major from Duluth, Ga., and Terp is a senior journalism and mass communication major from Temple Terrace, Fla. 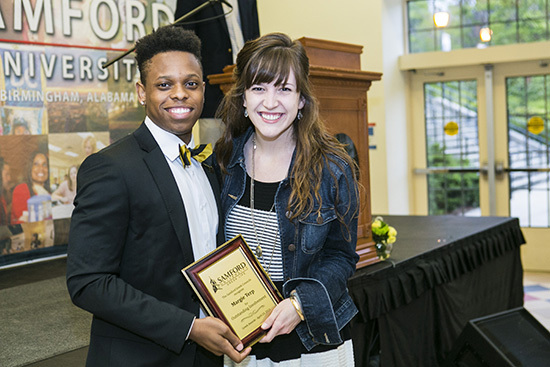 Emerging Leader: Jalen Spraggins (Alpha Phi Alpha) and Lilla-Bea Granger (Alpha Omicron Pi). Spraggins is a junior business major from Montgomery, Ala., and Granger is a freshman pharmacy studies major from Pike Road, Ala. Recognition of Council Presidents: Hallman (Zeta Tau Alpha), Jake Moore (Sigma Nu) and Jhamall Wright (Alpha Phi Alpha). Moore is a senior political science major from Marietta, Ga., and Wright is a junior exercise science major from Nashville, Tenn.
Greek Woman of the Year: Kendall McPheeters (Chi Omega), a senior biology major from Owens Cross Raods, Ala.